If I’m remembering correctly, this was the first time I’ve ever made a cream-based soup – kind of crazy. I’ve historically been bad at making roux-based sauces, those flour and butter and milk-infused concoctions. After researching roux online for this recipe and creating a cream-based sauce successfully (YEAH! ), I realized where I had always failed: I hadn’t slowly poured the milk into the flour and butter mixture, a little at a time, while continuously stirring. I would basically pour all of the milk in at once, and that resulted in a lumpy, not-so-graceful concoction. Now I FINALLY know what I am doing (ALFREDO sauce is in my future!!!). This is the best thing about cooking – besides the eating part, of course – this learning and exploration. Cooking is a journey! It’s experimentation, trial and error, straight riffing with the scraps in your fridge. It’s a metaphor for life in a kitchen microcosm – and we get to eat our successes! 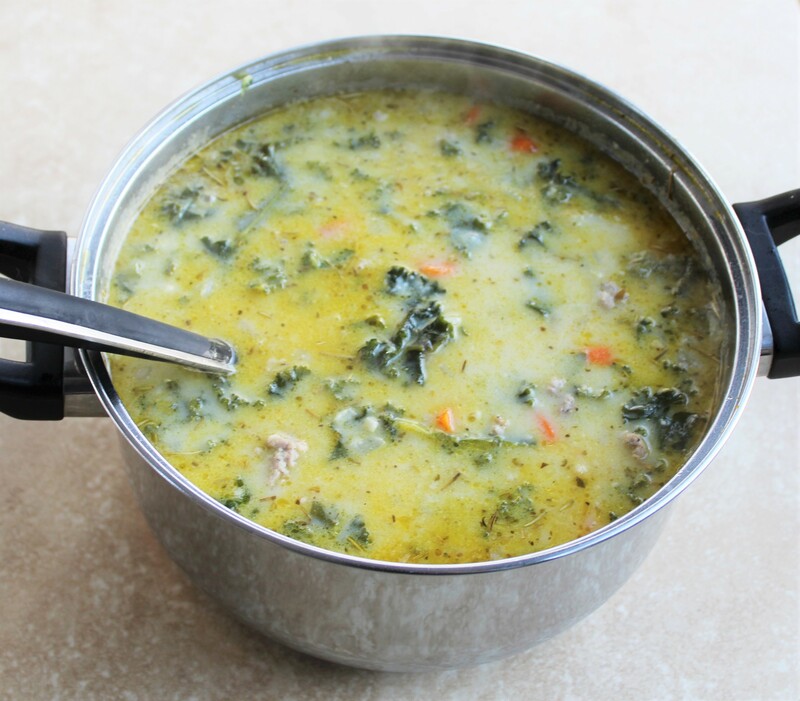 This foray into cream-based potato soup containing chunks of Italian sausage and my greens obsession, kale, turned out to be a favorable one. Sausage has to be one of the best cold-weather comfort foods. It’s savory and unapologetically fattening; if you’re a meat-eater, what’s not to like? And kale, that chlorophyll-infused love of my life! It is nutrient-dense, packed with fiber and protein plus vitamins and minerals such as vitamins K, A, and C, various B-vitamins, manganese, and iron. So it ups the health ante in a soup that unabashedly embraces the saturated fat (delightful in moderation!). 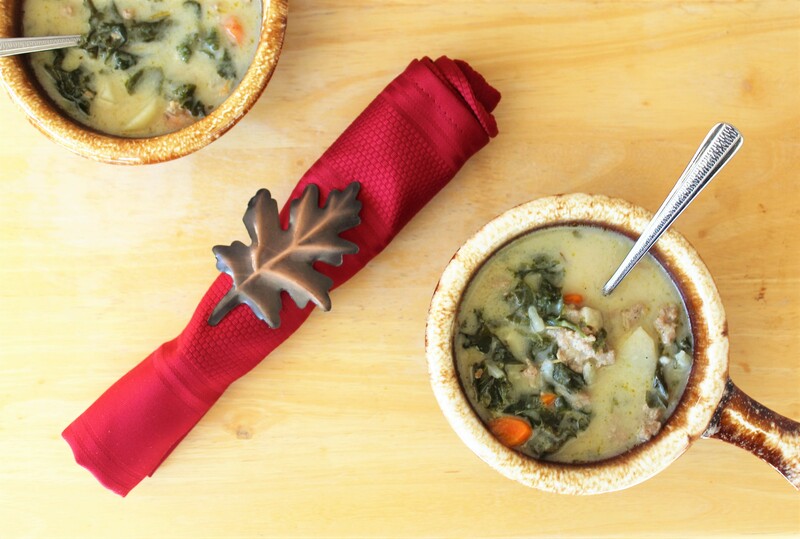 Plus, its thick texture means it holds up well in soups; this is no wimpy green! And we are no wimpy people. We are strong – we will survive the darkness (with the help of whole milk, potatoes, magical greens, and fatty pork)! -Add the loose, broken-up Italian sausage to a frying pan and let cook over medium heat, stirring frequently, until fully browned with no pink remaining, about eight minutes. To a large pot, add the oil, carrots, onion, and garlic. Cook over medium heat until softened, about five minutes. Then add the chicken stock, kale, potatoes, cooked sausage, and spices. Bring this all to a boil, then reduce it to a gently rolling simmer and let it do its wonderful, aromatic soup thing for about 25 minutes. Toward the end of that duration, melt the butter in a small saucepan over medium-low heat and whisk in the flour until a smooth, uniform paste forms (the roux! ); this should only take about a minute or so. Then slowly and gradually pour the milk in – continuing to stir as you do so – until a thick, creamy, sauce-like consistency emerges. Remove from heat and immediately stir this cream sauce into the soup pot until it’s well blended. And you’re done! Makes six to eight hearty servings.